Kurtis is the perfect dresses any time of the year. They are comfortable, easy to wear and can be accessorized really nicely. However, if you do not pay attention to what kind of kurti you are wearing and why then you just might end up spoiling a nice kurti look too! It is very important to have a knee length A-line kurti which complements your curves. You can wear these with Patiala pants, salwars as well as jeans. Leggings do not work well with them and hence it is best not to pair them with leggings. These are ideal for casual wear and work really well during the summer months. You can wear them for any occasion- from family picnics to lunch with friends. Short, knee-length A-line kurtis have a different appeal to them altogether. Along kurti, which will reach your heels, is another kurti type which is in trend these days and has a great appeal if you want to keep it stylish. You can pair these up with jeans or leggings whichever suits you the most and wear high heels or a pair of sneakers along with them. It is always best to go for prints when it comes to kurtis like these since they help in creating an impression. If you have to opt for dark shades, stick to solid colors and accessorize them oxidized silver jewelry. When you look through a kurti collection online shopping, look for collared kurtis. You can wear them short, like a kurta and team them up with jeans or you can opt for long collared kurtis that go well with jeans and leggings. These have a lean and well-fitted look to them and hence it is best to not wear them with salwars since they do not bode well together. If you want you can accessorize this look heavily with big earrings or big neckpiece or you can keep it really simple and opt for something absolutely minimal. Well, fitted short kurtis are ideal if you want to pair them up with Patiala pants. This kurtis can be paired with any kind of flared bottom like salwars as well. When colorful these make the right impression and can be worn with jewelry. Do make sure that you have at least one digitally printed kurti since these are in vogue these days. Funky prints like cameras, autos, rickshaws etc are very popular and more and more people are opting for them. If you are looking for something really casual, this is the one to go for. 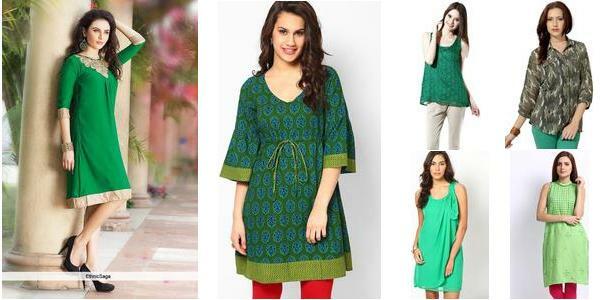 So, have you got an idea about the kurti types that you need to have? Start stocking them up today!